If you happen to find yourself visiting Kent and driving down the Thanet Way, you may find yourself glancing across to the sea and wondering about that old tower you see. The one that looks like the remains of something once much larger. 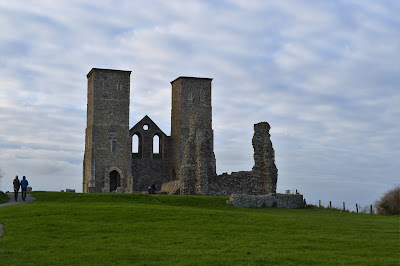 What you are seeing is the Reculver Towers, and they have been part of the Kent landscape since Roman times. Now maintained by English Heritage, Reculver Towers have a long history, dating back to the days when the Isle of Thanet was indeed an island. Centuries ago, the land that is now occupied by Ramsgate, Margate, and Broadstairs, was separated from the English mainland by the Wantsum Channel. The Romans built two forts to guard against Saxon raids: one at Reculver and one at the other end of the seaway in Richborough. Many years later, in the 7th century, the site became a monastery, part of St. Augustine's mission to bring Christianity to the British Isles. The land seen here to the right beyond the ruins was once an ancient seaway. By the 12th century, the Wantsum Channel was starting to silt. Boat traffic lessened because of the difficulty in navigating what was becoming marshland. Also at this time, the towers were repurposed again, becoming a church for the people of Reculver. Fast forward another 400 years, and what was left of the Wantsum was drained and turned into farmland. Ramsgate and Margate were now part of the mainland. All that remains of the waterway now is a narrow river. 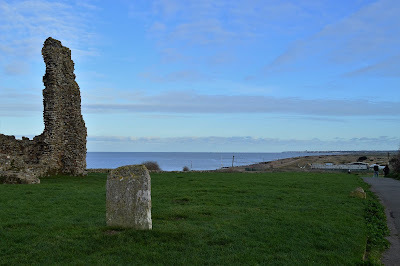 But the towers at Reculver still stand tall on the landscape, accompanied by headstones and graves from the 1700s, when it was still a parish church. 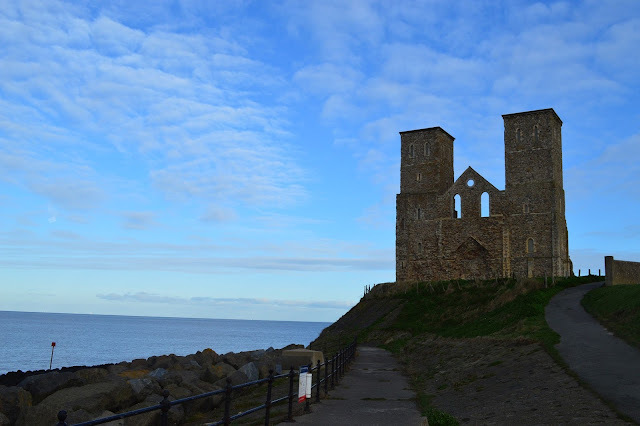 Reculver is open to visitors free of charge and is a popular Sunday afternoon walk destination. Love all your posts, especially the posts from your recent visit back 'home' for the holidays. 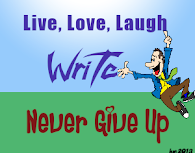 While I doubt I will make it to England, I can create a bucket list of places to visit thanks to you! Very interesting story and history.